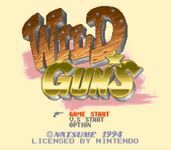 Wild Guns is a fixed-view third-person shooter by Natsume for the Super Nintendo Entertainment System in 1994 in Japan and in 1995 in North America. The PAL version was released in 1996 and published by Titus Software. It is also available on the Wii Virtual Console in North America on May 31, 2010 and in the PAL region on August 13, 2010. The game's setting is that of the Wild West but various science fiction elements are present; most notably robots, who serve as most of the bosses in the game. This mixture is a prime example of the Steampunk genre. The objective is to seek revenge against a murderous gang that killed the family member of one of the playable characters. The female character, Annie, has searched down a bounty hunter by the name of Clint to help her get revenge and to rescue the few family members she has left. The player or players navigate through several different levels fighting everything from towering machines to armored trains. The game employs a third-person, fixed viewpoint and is primarily about shooting, similar to Cabal. The player controls the movement of both the on-screen character and the targeting reticule with the directional pad. While shooting, the character stands still. Various maneuvers, such as jumping, double jumping and dodge-rolls are possible. Beyond the standard gun several other weapons are obtainable, such as a gatling gun, shotgun, or a grenade launcher though these hold only limited ammunition. As is common in shooter games, the player has access to a number of screen-clearing bombs. Source: Wikipedia, Wild Guns , available under the CC-BY-SA License.